We�ve compiled a handy guide to some interesting US fuel cell installations, many of which are used to power public establishments, giving you a chance to visit, view a fuel cell, or ask a few questions of the proprietors. With such a focus on new technologies for vehicles, people tend to forget that we can reduce emissions and increase reliability and efficiency on the stationary side right now. There are thousands of fuel cells installed around the world, and hundreds here in the United States. They are helping curb greenhouse gases while providing premium power and steady backup to a wide range of facilities. We‘ve compiled a handy guide to some interesting US fuel cell installations, many of which are used to power public establishments, giving you a chance to visit, view a fuel cell, or ask a few questions of the proprietors. We’ve arranged our listing by region and covered the Northeast, Mid-Atlantic and the South. There are plenty more on the West Coast, so we’ll save that for another trip. Maine – Start your trip off with a visit to the Chewonki Foundation Environmental Education Center, which uses a proton exchange membrane (PEM) fuel cell to provide backup lighting. “Green” hydrogen is produced onsite by electrolysis of water, via renewable power from solar panels atop the center and purchases of "green" electricity. Massachusetts – Hungry from your long drive? Stop by Whole Foods Market (located in Dedham) or Star Market (in Newton). Both grocery stores have installed 400 kW fuel cells that generate 90% of the store's energy onsite. Connecticut – There is a lot going on, fuel cell-wise, in Connecticut. First, check into the Mohegan Sun (Uncasville) and visit the Casino’s 400 kW fuel cell installation. Phosphoric acid fuel cell (PAFC) units are used to generate electricity for the entertainment complex, with waste heat recovered to preheat boiler feed water and generate domestic hot water. The indoor installation is open to the public, allowing visitors to view the fuel cells and learn about the benefits of the technology. Feeling hungry? Drive by the Pepperidge Farm Bakery (Bloomfield) for some wonderful aromas. The bakery uses two molten carbonate fuel cells (MCFC) – a 250 kW (installed in 2003) and a 1.5 MW (deployed in 2008) – to provide 70% of the bakery’s power. Excess heat from the newer fuel cell is channeled to support bakery processes, helping to reduce the amount of fuel needed for the plant boilers. Time to buy some sneakers for all the walking you’ll be doing on your trip. Stop by Cabela’s Sporting Goods (East Hartford) – the store uses four 200 kW PAFC units to baseload power. And if you missed the trip to the Massachusett’s Whole Foods Market, stop by the one in Glastonbury that uses a 200 kW PAFC to produce half of the store’s power and almost all the hot water. Ready for more education? Visit the Connecticut Science Center (Hartford), which features 150 hands-on exhibits, a state-of-the-art 3D digital theater, four educational labs, plus daily programs and events. The Center is installing a 200 kW fuel cell that will supply most of the power demand. Surplus electricity, generated at night when the Center’s power demand is lower, will be sold the local power grid. And while you’re in Hartford, be sure to ride CTTransit’s fuel cell hybrid bus. Up to 50 kg of hydrogen is stored on the roof using 5,000 psi tanks, which gives the bus a travel range of 250-300 miles. The bus is typically deployed on the Star Shuttle Route, but be sure to check with the agency since it also plans to deploy the bus on other routes. And don’t forget to get in touch with nature with a visit to Dinosaur State Park (Rocky Hills), where a 25 kW fuel cell provides part of the baseload power, and heating and air conditioning, for the Park’s Visitor Center. New York and New Jersey – Check into the Hilton New York Hotel or Sheraton New York Hotel and Towers, or the Sheraton Hotels located in Parsippany or Edison, New Jersey, where fuel cells are used to provide heat and power. At the Hilton, a 200 kW PAFC provides power and 100% waste heat recovery for hot water in guest rooms, kitchens and laundry. At the Sheraton New York, The 250 kW MCFC meets about 10% of the power and hot water requirements of the 1,750 room facility; at the New Jersey Sheratons, 250 kW MCFCs provides 25% of the hotels’ electric and hot water requirements. Next, head down to Times Square to check out the NASDAQ ticker atop the Conde Nast building. Did you know that two 250 kW PAFCs are used to power this sign? Everyone visiting New York has to spend some time in Central Park. 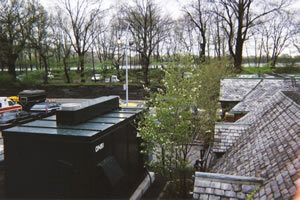 Jog on by the Central Park Police Headquarters, where a 200 kW PAFC provides all the power for the station, completely independent of the electric grid. In fact, during that big, multi-state power outage in 2003, the fuel cell kept the station operating normally - the officers didn’t even know the city’s power was out until they looked outside. While you’re communing with nature, stop by the Bronx Zoo and the New York Aquarium. The Bronx Zoo's historic Lion House, home to lemurs and other wildlife of the island nation of Madagascar, features gushing waterfalls, desert cactuses, and a lush rain forest—all supported by a 200 kW PAFC. 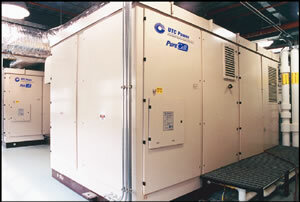 The Aquarium’s 200 kW PAFC provides 20% of the aquarium’s power needs and enough waste heat to warm domestic hot water and boiler supply water for buildings and tanks. Pennsylvania – Ready to go camping? Visit Parker Dam State Park and check out the Fuel Cell Pavilion. Here you’ll see a 5 kW solid oxide fuel cell (SOFC) that provides heat to cabins and administration buildings and hot water for showers. Also note that the SOFC is fueled with natural gas derived from Pennsylvania forests. Next, head on over to Pittsburgh and see Phipps Conservatory and Botanical Garden, where a 5-kW SOFC provides heat and power to the 12,000 sq. foot tropical forest conservatory. 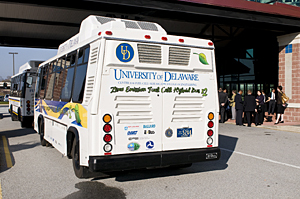 Delaware – If you’re visiting Newark, stop by the University of Delaware and hop on board one of the two fuel cell hybrid buses used on regular UD transit bus routes. District of Columbia – Need more gas to continue your journey? Pull into the Shell filling station on Benning Road in Washington’s northeast quadrant. While you’re filling your tank with gas, stroll over to view the hydrogen pump and visit the station’s hydrogen education center. 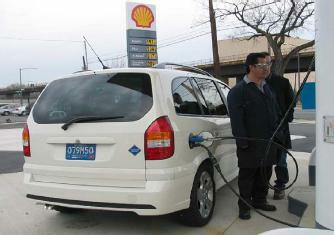 If you’re lucky, you’ll see a fuel cell vehicle being filled up with hydrogen! South Carolina – While you’re visiting this beautiful state, take a ride on the Hydrogen Highway, a 59-mile route between Aiken and Columbia. Each city now has a hydrogen station – Aiken’s station is used to fill fuel cell forklifts and will also support two hydrogen-powered internal combustion engine vehicles, while Columbia’s will support a number of hydrogen projects planned by the city. Florida – Why stay at a hotel when you can camp in warm and welcoming Florida? 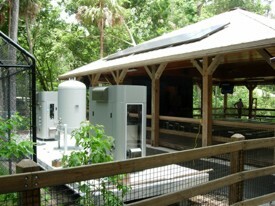 Pay a visit to Homosassa Springs State Wildlife Park where a 5 kW PEM fuel cell integrated with a solar photovoltaic system provides a portion of the power used at the Wildlife Encounter Pavillion. Hydrogen for the fuel cell is generated by an electrolyzer. And while they’re not fuel cell-powered, if you happen to be visiting Sea World be sure to take a ride on their hydrogen-powered internal combustion engine shuttle buses.